Every garden needs periodic fertilization. “Designer” fertilizers are available for some kinds of plants, and so are fertilizers that you’re directed to apply at specified times throughout the season. So roses get their rose food, tomatoes get their tomato food, and so on, on schedule. All this effort might make you feel good, but isn’t really necessary for your plants. Feeding plants can be very simple. For example, forget about all the machinations of getting fertilizer deep into the soil to feed the roots, as is sometimes recommended. Plants’ feeder roots are mostly in the top few inches of soil, so just sprinkle fertilizer on the surface or, at most, scratch it into the surface. Rain, time and earthworms will put the nutrients where they belong. If rainfall is insufficient — and that means a good soaking, enough to fill a straight-sided container an inch or more deep with water — then turn on the sprinkler for a while. Fertilizer recommendations often call for fertilizing two or more times each growing season. In fact, most “chemical” (or “synthetic”) fertilizers must be applied in small doses throughout the season. These chemicals dissolve quickly in the soil, so can wash away or burn plant roots if a season’s worth is applied all at once. You can get by with a single application of chemical fertilizer if you use a type specially formulated to release its nutrients into the soil at a slow rate. Such fertilizers usually are called “slow release” or “controlled release” fertilizers. Most “organic” fertilizers, which are derived from natural minerals, plants, or animals, are either slowly soluble in water or release their nutrients as they are “gobbled up” by soil microorganisms. In either case, nutrients are bled slowly into the ground, the practical effect of which is that you only need to apply the fertilizer once per season. Bagged or homemade compost is a special slow-release fertilizer. It’s relatively low in nutrients (so low that it can’t be legally called a “fertilizer”). But besides offering plants food, it also improves the soil for aeration and moisture retention, and supports a wide variety of pest-fighting and otherwise beneficial microorganisms. A layer of an inch or two laid down annually will provide a feast for your plants. 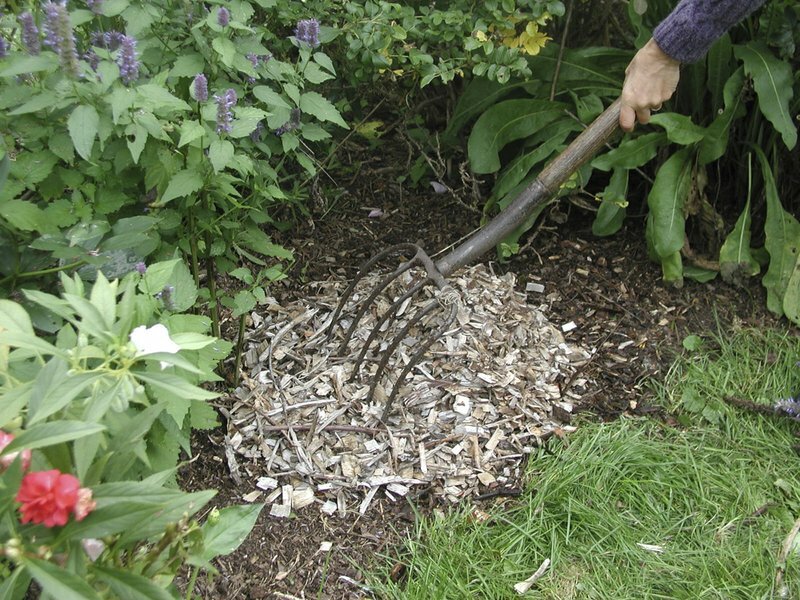 In fact, any bulky organic material — wood chips, straw or wood shavings, for example — laid on the ground as mulch will, as it decomposes, enrich the soil with nutrients (and provide some of the same benefits as compost). But the benefits will accrue at a much slower rate. Your plants might be hungrier for a more immediate feeding. For an organic fertilizer with less bulk, use some type of seed meal such as cottonseed or soybean meal, available at garden centers and feed stores. For ease of handling, pelleted organic fertilizers are also available. Another easy way to fertilize is by injecting fertilizer right into the water line while you are watering. Fertilizer injectors attach near the hose spigot, and bleed fertilizer at the correct rate into the hose line either from solid tablets or from a concentrated fertilizer solution you mix up. A fertilizer injector could be combined with a drip irrigation system. Install a backflow preventer, sometimes called an anti-siphon device, at the spigot whenever you use a fertilizer injector to avoid siphoning fertilizer into your water system should your water pressure drop. Fertilizer injectors can only be used with readily soluble fertilizers. As much as fertilizer is needed in a garden, too much can be as damaging as not enough, rendering plants susceptible to pests and burnt roots, even killing plants. Follow application directions. Also, we’ll soon be approaching that midsummer time when plant growth should start to slow down in preparation for winter, and should not be stimulated by fertilizers. Finally, remember that plant health also reflects weather conditions, the plant variety chosen, and pests. Fertilizer is just one component of plant health. An old saying has it that “the best fertilizer is the shadow of the gardener”; pay frequent attention to your plants.